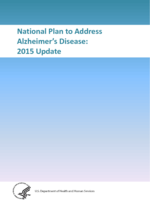 This is the PDF version of the 2015 Update of the National Plan to Address Alzheimer's Disease. There have been updates yearly since this report was originally published in 2012. A complete list of the National Plan and updates, and their direct URLs, is available on the second page. More information about the National Alzheimer's Project Act is available at https://aspe.hhs.gov/national-alzheimers-project-act.